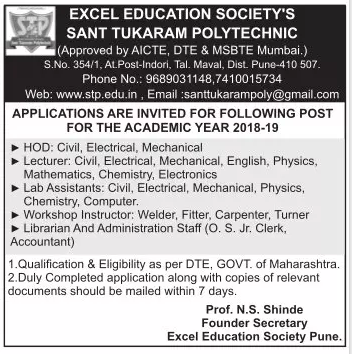 Excel Education Society's Sant Tukaram Polytechnic, Pune has advertised in the LOKSATTA newspaper for recruitment of Teaching Faculty- Lecturers / HOD Plus Non-Faculty jobs vacancies. Interested and eligible job aspirants are requested to apply within 07 days from 07th June 2018. Check out further more details below. About College: Excel Education Society's Sant Tukaram Polytechnic started with an aim to become one of the premier Educational Institute in Pune. Sant Tukaram Polytechnic started in the year 2014-2015 with three core engineering disciplines Civil Engineering, Electrical Engineering and Mechanical Engineering. Sant Tukaram Polytechnic is approved by AICTE, New Delhi, Maharashtra Government, DTE, Mumbai and affiliated to Maharashtra State board of Technical Education, Mumbai.